The New Inn at Waterley Bottoms was established in the early 1900's and was originally a farm cottage which was known for serving cider to the workers of a nearby foundry. In keeping with its origins, the pub today is famous for its large selection of draught ciders it offers its visitors. The New Inn proudly boasts its achievement of being two times winner of the Gloucestershire cider pub of the year award. We are a child, dog and horse friendly pub. Our expansive garden which was featured in The Sunday Times "Top 10 Pub Gardens" list, is an ideal spot to enjoy the sunshine and take in the views of Waterley Bottoms whilst relaxing with your favourite drink and a bite to eat. 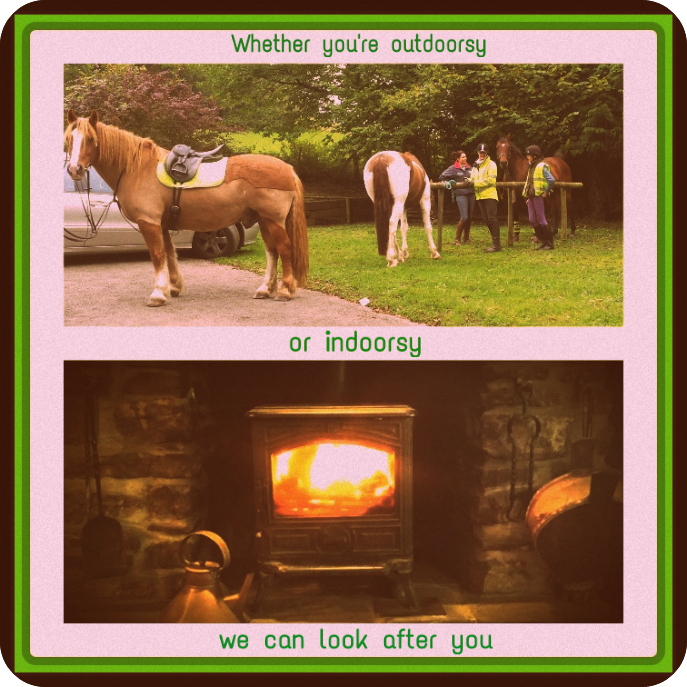 Horse riders are welcome to come in and enjoy the comforts of the pub, you will find a trough at the top of the garden for your convenience. Our wooden terrace offers shelter from the sun and the less favourable weathers with tables which are warmed by gas heaters and overhead heat lamps. The garden has swings to keep children entertained, and the terrace houses a pool table for the adults. During the evening the pubs snug bar becomes a lively hub for the friendly locals who bring a welcoming, fun community atmosphere and the lounge bar with its warming cast iron log burner offers a comfortable, homely environment, perfect for relaxing or dining. *Please note that children are always very welcome in our pub, however, we politely request that the Snug Bar is an adult only zone after 6pm. The evening menu is updated regularly to incorporate the seasonal vegetables offered by the pub's local farm-shop, all food is prepared and cooked on site with quality, fresh ingredients and all meats are sourced from local butchers.